Welcome to Episode 012 of the Ideas Architect Podcast. Geoff McDonald shares a Book Rapper recording. In this episode he takes the ideas from Daniel Pink’s best selling book A Whole New Mind and raps them for you in under 30 minutes. How the past few hundred years has been dominated by left brain thinking. 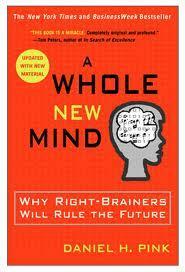 Why the future favours the right brain thinkers. Love to hear your thoughts about the intro jingles in this episode… Do you prefer our regular podcast intro or the Book Rapper one?